Peter Anich (1723-1766) was a farmer and a self-taught cartographer and engraver. He made a large celestial globe in 1755-1756, and a companion terrestrial globe in 1759. He made a map of the area around Innsbruck, Austria, published in 1772, and, with Blasius Huebner (1735-1814) as his assistant, he prepared the maps for the Atlas Tyrolensis, which was published in 1774. The atlas contained 20 sheets engraved on copper at a scale of 1:103,800. 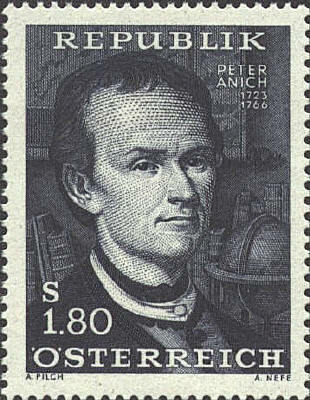 The stamp was issued in 1966 to mark the 200th anniversary of his death. The portrait is similar to one engraved by Weiss. The globe in the background refers to his globes. It appears to be a terrestrial globe. His globes are in the provincial museum in Tyrol. The map on the wall is probably his map of the Tyrol. 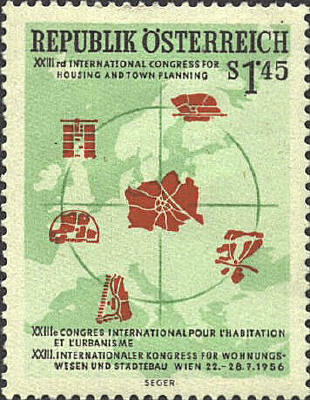 The Austrian stamp was issued for the 23rd International Housing and Town Planning Congress held in Vienna in 1956. 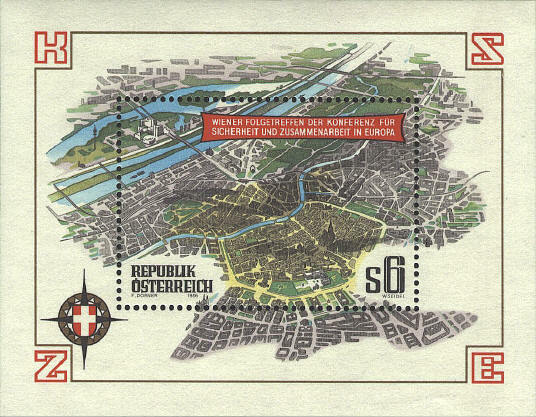 The central city plan is Vienna. The others I don't know. The Ringstrasse is a wide avenue which encircles the old city. It was constructed in the late 19th century, and ever since it has been the focal point of Vienna's city center. Within that area St. Stephen’s Cathedral stands above the rest of the buildings on the stamp.